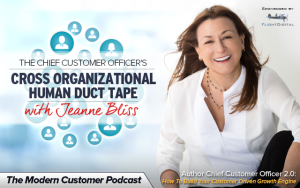 Did you know that Chief Customer Officers are the human duct tape of the organization? Chief Customer Officers are one of the fastest growing roles within organizations today. The Chief Customer Officer reports to the CEO and is responsible for the end to end customer experience. While the Chief Customer Officer is a highly influential role within the company, you don’t have to be a C-level officer within the company to impact change around the customer experience. But you do need to understand how to be a strong relationship builder, according to author Jeanne Bliss. If you’re trying to build influence at your company how do you go about getting meetings with people such as the CFO–and why would you want to do that at all? Bliss has some ideas around how you can do this well. She’s recently published Chief Customer Officer 2.0: How To Build Your Customer Driven Growth Engine (Wiley). Bliss has real-world experience having held senior customer strategy roles at Lands’ End, Microsoft, Mazda, Coldwell Banker and Allstate Corporation. She is the President of consulting firm Customer Bliss, she’s the author of two other books including her first Chief Customer Officer (Josey-Bass) and I Love You More Than My Dog: Five Decisions That Drive Extreme Customer Loyalty In Good Times and Bad (Penguin Group). She’s an experienced practitioner and thought leader who doesn’t sugar coat the facts. Listen in to our podcast below.